Research on digital storytelling suggests that students are encouraged to think more deeply about the meaning of the topic or story than if they were to write a term paper. Prior to and during the process of developing and communicating their stories, students must: (1) recall and sort through what they know about the information that they want to present; (2) identify what they truly understand and seek further knowledge for things that they don’t understand; (3) evaluate and determine the information (both visual and verbal information) that the story needs to effectively communicate the information; (4) progress through the writing process (brainstorm, storyboard, outline, write the draft of the story…etc. ); (5) and finally, create the actual story. Bloom's Taxonomy, anyone? When using digital storytelling as a mechanism for learning, students do not just report facts and concepts connected to the subject, but instead, they reflect on their own thoughts and engagement with the subject. Students learn to think and write about people, places, events and problems that characterized their individual life experiences or others’ experiences. Thus, they tend to personalize their experience, which makes learning more meaningful. In addition, digital storytelling provides a real way to help students learn how improve their media-creation skills and importantly, to use technology effectively in their learning, particularly if provided with appropriate digital resources and usable editing tools to further motivate them into creating quality stories. Research has revealed that students enjoyed the use of digital cameras (video and still), searching Web resources, authoring in various slideshow or movie creation applications, and “playing” with other non-linear editing tools to create short stories. Students also take pride in the digital stories they create; they enjoy and dedicate more time to the tasks necessary to create a meaningful digital story. 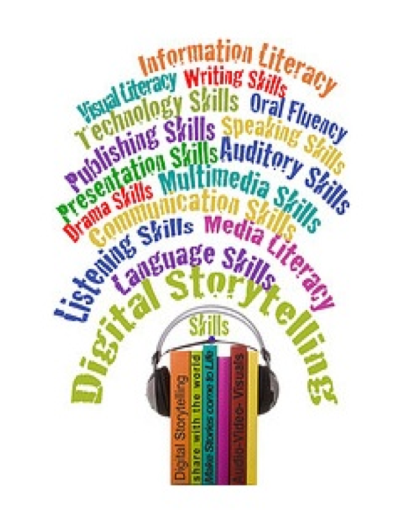 Lastly, if the student, and especially the teacher, is using digital storytelling as a means of instruction, there are two highfalutin terms to know and understand. First, the multimedia principle (Mayer, 2001), suggests that students learn better from words and pictures than from words alone. Makes sense, doesn’t it? Happily, digital storytelling usually involves both words and pictures – it’s a built-in feature. Second, is the modality principle, which suggests that students learn better when words are presented as spoken text rather than written text. The problem is that not all digital storytelling tools include narration capabilities. Voicethread, a commonly used Web 2.0 tool within education, does, and this is the reason upon which we will focus on Voicethread…..oh, that, and because it’s REALLY EASY!